The object of the game is, basically, to shoot the invaders with your laser base (D) while avoiding their shots and preventing an invasion. Amassing a high score (F) is a further objective and one that must be prioritised against your continued survival. Each game screen starts with five rows of 11 invaders. 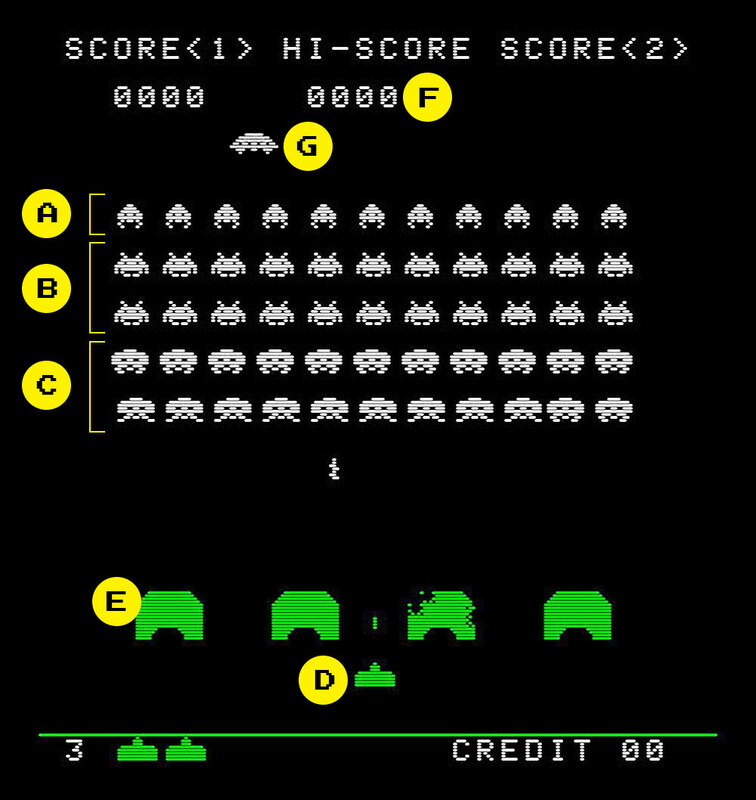 The bottom 2 rows score 10 points per large invader (A), the middle 2 rows 20 points for each medium invader (B) and the top row scores 30 points for each small invader (C). This makes each screen worth a total of 990 points. The score for each screen can be dramatically increased by the tactical destruction of the 'mystery' value spaceships (G) that frequently fly from one side of the screen to the other. Temporary sanctuary can be sought beneath the 4 base shelters (E). The invaders randomly fire missiles down the screen from the centre of their bodies. There are 3 types of missile: slow straight ones, fast straight ones and wiggly ones which are the most powerful. If a missile hits the player's laser it is destroyed. If all the lasers are destroyed the game is over. The missiles also cause varying degrees of damage to the base shelters. If any invader reaches the bottom of the screen the game ends, no matter how many remaining bases the player has. The invaders travel sideways and each time they touch the side they drop down 1 line. On screen 1 they need to drop 11 lines to reach the bottom and 'invade'. From screen 2 through to screen 9 they start progressively lower down the screen. At screen 10 the game reverts to the screen 1 start position and the cycle begins again. There is no time limit, except for the fact that if you do not shoot them all before they reach the bottom of the screen the game ends. 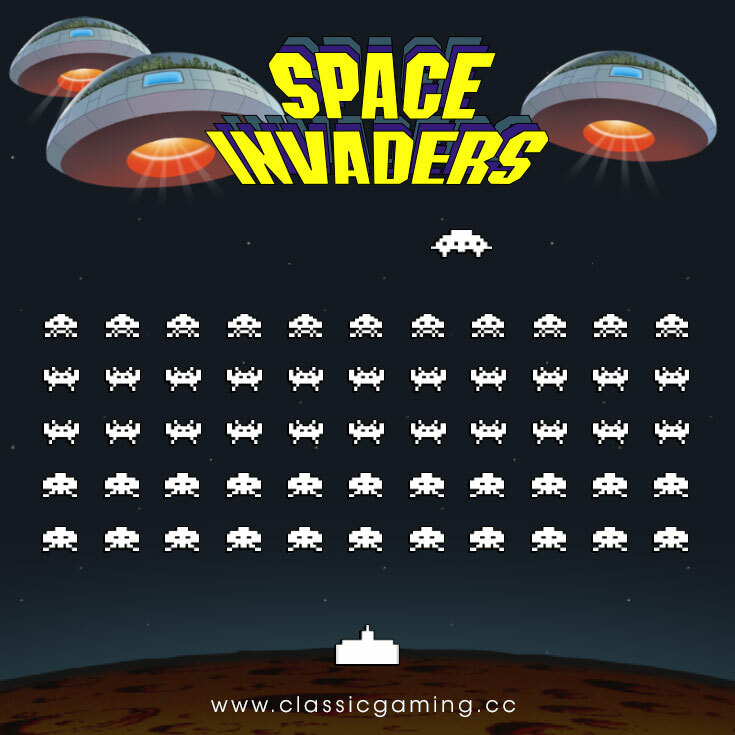 The more invaders the player shoots, the faster the remaining invaders move. When the invaders are low enough to touch the base shelters they erase them as they pass. The last invader moves very quickly, but slightly faster lef to right than right to left. Any missiles dropped by an invader on the row above 'invasion' row will not harm the player's laser. This is a very important feature and one that must be fully exploited in order to obtain a high score. This will be dealt with in detail later. An invader can have a maximum of 3 missiles on screen at any one time. The player can have only 1 laser shot on screen at any one time. When an invader's missile collides with a player's laser shot, the player's shot is always destroyed but the invader's missile occasionally survives, almost certainly if it is a wiggly missile. The game has a 'heartbeat' rhythm that the player should become attuned to. After playing for some time, it's possible for the player to move and fire in-time with the games cadence. Masters of teh game have been known to hold conversations and appear completely uninvolved with the game once this higher level of interaction has been attained. It's possible to achieve very impressive scores on Space Invaders without this total immersion in the game's rhythm, however we recommend that anyone wishing complete Space Invader dominance should concentrate on mastering the 'heartbeat' rhythm. 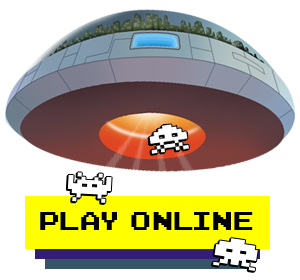 The speed with which the invaders descend can be quickly controlled by the player. They only drop when they reach the edge of the screen (right or left) so by shooting away the outer columns before the inner columns the rate of descent can be slowed. Masters of the game have been known to wipe out almost every single invader before they have dropped a single row. This feat can be achieved by quickly wiping out the rows from left to right. The invaders should always start by moving left to right. Use the shelters to hide behind, timing your movement to avoid missiles while shooting whenever you get the chance. This technique is still useful for more experienced players from level 4 onwards. Beware, however of a volley of invader missiles that can break through the shelter while you are hiding under it. If the centre of the shelter is already damaged, shoot a clear hole through it and fire from there. This technique is especially useful at the start of a level using the far left shelter. The first three columns on the left can be safely wiped out almost all of the time by using this method of protected attack. Use the protective shelter as a barrier against enemy fire. In conjunction with learning the rhythm of the game, you must perfect a move-stop-shoot technique to keep up with the invaders and wipe them out as efficiently as possible. Note: Following a fast moving group of invaders is a very good way to run into a missile! It can be done but a good 'feel' for the game must be achieved in order to avoid disaster. A much better approach for dealing with the final few invaders, in particular the very last one, is to wait in the middle of the screen, firing ahead of the invader while nudging the movement control in the direction it is travelling to avoid a missile dropped directly over the player's laser base. Every time you fire and miss you must wait until the shot reaches the top of the screen before firing again. Remember this and do not fire wildly at fast moving invaders, especially the last one. You will have time to shoot it if you do not waste time missing! The last invader is usually easier to hit when travelling right to left. These tactics should get any beginner through to screen 3 or 4 if they are perfected and applied consistently. Once a player can regularly reach screen 4 without losing a life it is time to learn how to really master the game. I am talking about 'clocking' it past 9990 over and over again, always scoring 300 points for a mystery ship, hitting 8 and more mystery ships per screen, hitting the mystery ship (almost) every time it appears, and reaching the 10th screen...and beyond. How to always score 300 points for shooting the mystery ship. The score for a mystery ship is not based on any random event, it is controlled by the number of shots fired by the player before the mystery ship is shot. On every screen the mystery ship is worth 300 points if hit with the 23rd shot and on every 15th shot until that board ends. This counting pattern works on every board. How to (almost) always hit the mystery ship. If the mystery ship is travelling left to right, move to the right hand side of the screen and fire when the mystery ship is directly under the 'C' of player two's "score." If it is travelling right to left, move to the left hand side of the screen and fire when it is directly under the last digit of player one's score (for example, if player one's score is 9990, fire when it is directly under the zero). The mystery ship appears at regular intervals of roughly 25 seconds. There is a tactic in space invaders called the 'wall of death' (also called the 'death row'). At a very specific time in the game, the player's laser base seems to become impervious to the invaders' missiles! When a line of invaders is on the second to last row (the one before they "invade") their missiles cannot harm the player's base. Originally it was assumed to be a bug in the program, but I am fairly sure it was a deliberate feature (maybe the first video game "easter eggs"). Either way, it is a vital feature of the game that can be exploited to reach level 10 and beyond. 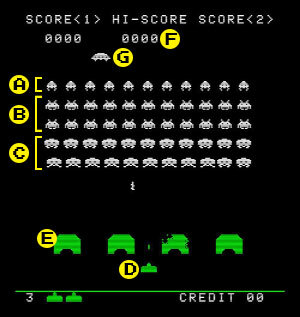 Shoot the invaders to leave a formation similar to the one in the screen shots below. This is the classic 5 + 1 formation (you can use this technique on almost every board). The trick is to travel with the invades when the last row is hurtling across the screen, shooting them in turn from right to left and hitting the last one just before it overtakes you. Of course, if you miss him you lose a life (but that is the risk you take). Player one in the 'safe place' while waiting for the invaders to reach 'Death row'. The first "easter egg" in a video game? Player one is immune to missile fire. Shoot the bottom row while moving right-to-left (back to the 'safe place'). Five 10 pointers down, only 4 rows to go. Reasons why you need to use this technique. It slows the pace of the game from frantic to leisurely, giving you lots of time to blast mystery ships. If you can combine the 'counting' technique with the 'wall of death' you will amass some pretty impressive scores. Unless you are a phenomenally adept player, you may never score 9990 without using and mastering these two techniques. It is an "all or nothing" situation. If you miss the last invader, you lose a life (and possibly the game). Sometimes the invaders will be travelling the 'wrong way', but it is hard to tell at the beginning of the screen if this is the case.This situation usually arises in a two player game when one of the screens start differently, with the invaders moving right-to-left. If you can spot this, set your "safe place" up on the right-hand side of the screen (rather than the left). The two methodsof play (counting technique and the 'wall of death') will not guarantee high scores on their own. The player really must also master the basic principles and the rhythm of the game to maximise your score.